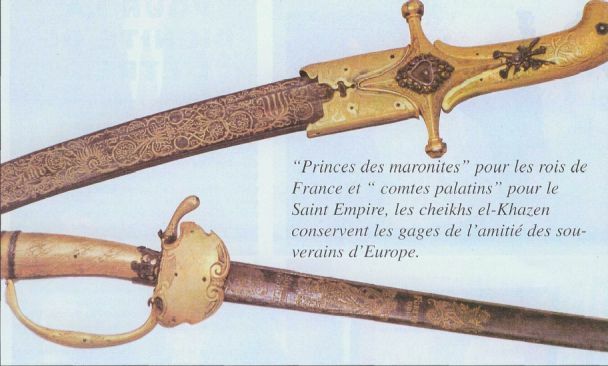 These two swords offered by King Louis XIV and Pope Clement X are found at Jean-Philippe el Khazen’s residence. The manuscript, written by the Kadisha valley monks, the sacred valley of Lebanon’s hermits, is written in Syriac. Back in the seventeenth century, France was very fond of Cheikh Abou-Naufal el-Khazen, a devoted Catholic and a loyal servant to the Church in the Middle East. In 1655, King Louis XIV named him consul of the French nation in Beirut, making him the first non-French to ever occupy this position. On the first of May 1657, he received the nationality and nobility papers that he was entitled to pass to his sons and daughters. Ever since the Khazen were known as Princes of the Maronites and Mount Lebanon. The correspondences were signed by King Louis himself, Mazarin, Pont-Chartrain, and Colbert de Torcy and remained in effect until Louis XV’s reign. All are archived and well preserved by the Khazen family. Nowadays, a member of the Khazen family holds in his Kesrouan villa, the most beautiful gift from Louis XIV, also known as Le Roi-Soleil: a simple sword with a steel blade and a hilt covered with silver and copper, the proud work of Ottoman artisans. It was Denis de La Haye-Ventelaye, French Ambassador in Constantinople, who delivered the prestigious gift. The second sword displayed was a gift from Pope Clement X, who was very fond of the monasteries that the Khazens had established in the region of Kesrouan and their generosity towards the Catholic missionaries and churches. The sword is from the 18th century, is made of silver copper and steel and illustrates the quality of the Roman Knight. The Khazens in fact were given the title of “Comte Palatin” by the pope. Khazen family members nowadays continue to hold on proudly to their heritage and achievements and raise high their beautiful armor, showing the majestic Cedar tree on top of a snowing mountain from one side and a gate protected by two lions on the other.